Investment winners: Mentor Dr Francois Toerien (third from right) with winning commerce students (from left): Alastair Murie, Lauren Reeves, Benjamin Shaw, Monique Baars and Sam Barton-Bridges. The team will represent South Africa at the regional finals of the CFA Institute’s Global Investment Research Challenge next year in Milan. UCT will square off against other universities in April next year in a bid to win the regional leg and go through to the finals of an international investment competition. The university’s team, consisting of five commerce students, won the national finals of the Global Investment Research Challenge (GIRC) – making it the fourth win out of five entries. The GIRC is an annual competition run by the Chartered Financial Analyst (CFA) Institute. “Truly, we’re the All-Blacks of this sport,” quipped Professor Don Ross, dean of the Faculty of Commerce, after congratulating the students on their win. “The GIRC takes place in three phases,” explains Dr Francois Toerien, who selected and mentored the team, consisting of Alastair Murie and Monique Baars, both master’s students, as well as Lauren Reeves, Benjamin Shaw and Sam Barton-Bridges, all fourth year business science students. In the first round about 137 CFA member societies, of which SA is one, run local competitions to determine a society – and in most cases national – champion. In the second phase, the local champions compete in one of four regions (Asia-Pacific, the Americas, New York and Europe-Middle-East-Africa) to determine a regional winner, who competes against the other regional winners to establish the global champion. The objective of the competition is for a team of students to analyse a prescribed listed company. They must write an investment report on the company, from which the top four were selected to present their investment analysis and recommendation to a panel of industry experts. 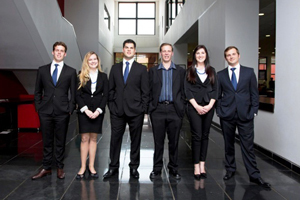 This year the teams from 10 South African tertiary institutions analysed cellphone giant MTN. UCT compiled one of the top four reports and, together with University of Johannesburg, Stellenbosch University and Wits teams, presented their investment cases. “The teams had 10 minutes for their presentation, which was followed by 10 minutes of intense questioning by the three judges. Time limits are very strictly adhered to and the presentations were all of an extremely high standard,” adds Toerien.